September Program & Beginning of our New Fiscal Year! We have a lot of great events and walks scheduled for our new year beginning in September. You should be receiving our September newsletter in your mailbox soon. Our first program of the year begins with Tom Ryan on Least Terns, details below. At the refuge the September tour is a National Public Lands Day event, which you will find on our September calendar for your convenience along with all our regularly scheduled walks. Note Colorado Lagoon walks will resume in October. Also on September 15th we’ll be participating with El Dorado Nature Center for California Coastal Cleanup Day. In October we are pleased to present our first birding class — many thanks to Anne Maben and Charlie Collins for putting this great resource together for all of us! Finally, 2019 is our 50th Year Anniversary! We hope you enjoy all the activities this year and look forward to seeing you soon! Our first general meeting of our new year kicks off with a few short announcements followed by a presentation on Least Terns by biological consultant and researcher Tom Ryan. Mr. Ryan has been trapping and marking adult California Least Terns throughout colonies in Southern California since 2012. He has conducted studies of their movements using light-level geolocators and more recently has been attaching field readable alphanumeric bands in order to better understand movements between their colonies and to look at the population structure. Colony monitors have noted lower productivity at colonies for the past 10 years and there is fear of a population decline in the coming years. He will show how biologists are trying to study this issue and present the latest information that informs us of where their population is heading. He is also teaming with researchers in Baja California to try to determine the southern extent of the “California” least tern. Join us for this interesting event on Thurs., Sept. 20th, at 7:30 p.m., El Dorado Nature Center, 7550 E. Spring St., LB. Doors open at 7:00 p.m., program ends 8:30 p.m. followed by a brief Q&A, doors close at 9:00 p.m. Parking is free and light refreshments will be served. Please bring recyclable cans/plastic bottles with caps removed to help support chapter activities. Hope to see you there! https://eldoradoaudubon.org/wp-content/uploads/2018/08/6-3-16-025e.jpg 497 657 Cindy Crawford http://eldoradoaudubon.org/wp-content/uploads/2016/02/eldorado.jpg Cindy Crawford2018-08-15 19:30:132018-08-15 19:30:13September Program & Beginning of our New Fiscal Year! This workshop is now closed, with 7 people on the wait list. Please contact Anne Maben at afmaben@gmail.com close to the workshop to see if there will be any openings. For those who registered please watch your email for communications from the instructors, if you can’t make it to class please call the instructor so those wait-listed may attend. Thanks!!! El Dorado Audubon is pleased to present our fall series birding class, developed and taught by Dr. Charles T. Collins and Anne Maben. To register for this class please click here. Workshop dates are Saturdays 8am to 12 noon: Oct. 20th, Oct 27th and Nov. 17th (will be held near El Dorado Park). In addition, three optional accompanying field trips for class participants to practice their skills will be also offered on Nov. 10th (wetlands habitat, 8am to 10am), Jan. 5th (coastal ocean ecosystems, 8am to 12 noon) and Feb. 2nd (spring migrants in oak woodlands habitat, 8am to 12 noon), which participants won’t want to miss! Additional information and updates will be posted here on El Dorado Audubon Society’s website. To register, please click here. There will be a limit of 30 class participants as space is limited. There will be a wait list should space become available due to any cancellations. Please contact Mary Parsell at (562) 252-5825 or by email mfp2001@hotmail.com if you are interested or have any questions. Dr. Charles Collins is a retired CSULB Professor of Ornithology, a founding member of the El Dorado Audubon Society and continues to conduct research on swifts and local tern/skimmer species. Anne Maben has been an educator for 45 years, a wildlife biologist studying endangered species in Micronesia and currently serves teachers as a Professional Learning presenter for the UCLA Science Project. https://eldoradoaudubon.org/wp-content/uploads/2018/08/EDA20news20header-bird20class-big.jpg 640 960 Cindy Crawford http://eldoradoaudubon.org/wp-content/uploads/2016/02/eldorado.jpg Cindy Crawford2018-08-07 02:55:102018-09-18 13:15:41Birding Classes! 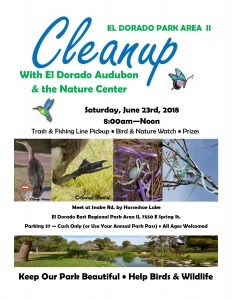 Saturday June 23rd, 2018, from 8am to 12 noon join El Dorado Audubon & El Dorado Nature Center for a morning of trash cleanup in the park. Bags and supplies will be provided by the Nature Center. Along the way we’ll watch and ID the numerous birds common in this area. We’ll meet at the corner of Snake Road by Horseshoe Lake, look for our signs and check-in table. Park along the road. Return to our table at 11:30 am with your filled trash bags to automatically be entered in the prize drawing. Must be present to win. Click the graphic to download the flyer. Sadly litter such as plastics, styrofoam, fishing line and ribbon not only detract from the park but pose deadly risks to birds and wildlife. 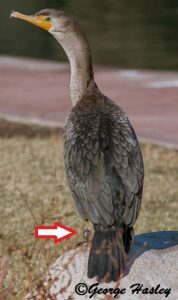 Every year numerous birds are injured at the park becoming tangled in fishing line and hooks. Long ribbon in the park is often used by the birds in nest building, posing a hazard should the birds become tangled. Plastics and styrofoam are often mistaken for food and ingested by birds, fish and other wildlife. The good news, there is something we can do to help – every piece of trash picked up can save a life! Note: Parking fee on weekends is $7 cash or annual pass. Pedestrian and bicycle entry is free. Enter at the main entrance on the north side of Spring Street, just past the entrance fee booth turn right and follow the signs. Photo credits: Crow with an injured foot looking for food in litter by C. Crawford; Double-crested Cormorant hooked in fishing lure by George Hasley; El Dorado East Regional Park near Snake Rd. & Horseshoe Lake–the location of our cleanup event, by C. Crawford. Our last walk of the season wasn’t as birdy as I expected it to be, but we still saw 20 species! 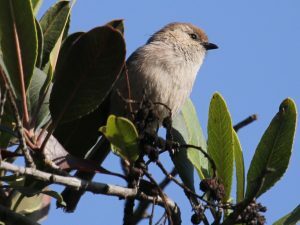 We had up close looks at Bushtits and were able to distinguish male from female. I learned that, during breeding season, males have black eyes and females have pale yellow eyes. We also got a fairly good look at a Hermit thrush and a better look at a Pacific-slope flycatcher (shown in the header photo). A small flock (17) of Cedar waxwings were seen flying over the Rancho. Other flyovers included nine Mallards, some way-up-high gulls and a couple of Ravens. We heard several birds that we never could see, including Red-shouldered hawk, House and Lesser goldfinch, Orange-crowned Warbler and a Robin. 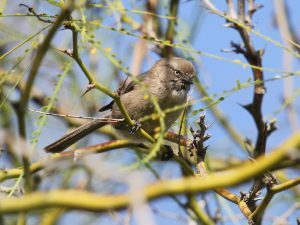 This is the last walk put on by El Dorado Audubon, but the Rancho has now started a family-and-beginner-friendly walk the fourth Saturday of every month. It also starts at 8:00 a.m. and ends at 9:30 a.m. If you couldn’t attend one of our walks, and still want to bird the Rancho, this is your chance. For more information on their walk, go to their website at: www.rancholoscerritos.org. Many thanks to Merryl Edelstein and Jerry Millett for helping me out again in April and to Marie Barnidge-McIntyre, the Horticulturist for the Rancho, for having us in and helping. https://eldoradoaudubon.org/wp-content/uploads/2018/04/EDA-news2.jpg 540 960 Cindy Crawford http://eldoradoaudubon.org/wp-content/uploads/2016/02/eldorado.jpg Cindy Crawford2018-04-05 04:02:382018-04-05 04:04:01EDA in the News! On behalf of the El Dorado Audubon Society, the undersigned submits this letter in comment to the above project. In keeping with our mission, El Dorado Audubon has been an active member of the Los Cerritos Wetlands Authority’s Stewardship Program since 2009 and has led educational bird walks for the public at the Los Cerritos Wetlands since 1979. In addition, for years we have conducted regular bird counts and surveys at the wetlands. Our current work at the wetlands also includes participation in the restoration planning public process. We have provided comments and suggestions throughout the conceptual planning process and any proposed restoration. In general, per our mission, we are in support of good restoration efforts not only to conserve habitat for native birds and wildlife but also to restore habitat whenever possible. We have prepared a list of concerns (set forth below), for which we regularly have meetings directly with the project proponents to discuss. It is important to note many of our concerns have been addressed, and some are topics of ongoing communications. The goal of the Los Cerritos Restoration project is to create the best possible Southern California Wetland, i.e., a nature preserve NOT a recreational park. As a nature preserve, its primary function is to protect rare biological resources and natural communities. For this reason, only passive recreational activities (hiking, photography, bird watching and nature study) are appropriate. Trails should be open to foot traffic only, of limited, non-intrusive width, and visitors must stay on them at all times. Kayaks should not be permitted. EIR describes 1 acre of parkland and picnic benches (originally 4 acres in DEIR but reduced in final EIR). A better designation would be “outdoor educational center” as the actual intended usage was explained to EDA as more of an educational gathering spot by the parking lot, not a parkland or picnic area. The FEIR describes about ½ dozen picnic benches, with gravel and native plant cover – is an acre really needed? More details of how the acre would be used are needed in the EIR documents. Public access trails, sidewalks, bike lanes along Studebaker Road: The trail is described as 10’ wide decomposed granite. More details of the sidewalk and bike path, and how access from the sidewalk and bike path to the wetlands will be controlled, should be defined in the EIR. The 10’ wide trail should be reduced to 3’ to 5’ wide, as you would find on the Bolsa Chica Mesa Trail. Like the Bolsa Chica Mesa public access trail area, the Studebaker “bluff” is also a relatively narrow strip of land. Monitoring/limiting “recreational use” such as trail hours of operation, how the trails will be controlled and types of recreation is allowed, with the goal of minimizing human presence impacts to the habitat, birds and wildlife. EDA believes that the current oil operations and infrastructure pose a greater risk to the remnant and functional wetlands, “Steamshovel Slough”, than the potential risks from the proposed reconfigured oil operations. This plus the absence of the added, restored wetland acreage means that the “No Project” alternative is not a prudent approach. The proposed interpretive center offers a unique opportunity to educate the public about the importance of marshlands and wetlands, through illustrative displays of marsh habitats and the respective plant, animal, and bird life found in each zone and the larger web of life dependent on these essential habitats. It offers further opportunity to illustrate the interaction of man with this particular marsh from Native Americans to the present, including how the greater marsh of which Los Cerritos is a remnant became degraded and, in a sense preserved ultimately by the oil industry maintaining open spaces and remnant marsh and wetland allowing plants and wildlife to survive. Protect the existing marsh from sedimentation resulting from restoration activities. Use native plant & marsh plant species only from our specific area, appropriate for the habitat types on the project area. Ensure any upland habitat impacts are temporary and result in increased quality habitat for use by birds and wildlife. All contamination cleanup uses best available methods. Bird friendly building techniques (bird safe glass measures, shielded lighting, lights out at night to prevent bird strikes). Native tree and plant landscaping. Preservation and restoration of any wetlands resources on the property. Baseline studies of fish and other aquatic creatures should be done pre-restoration to measure against post-restoration conditions. All of the area acquired by the Los Cerritos Wetland Authority including marine, tidal salt marsh, and upland components should be designated a “biological reserve” consistent with Section 4.4.8 of SEASP zoning. In conclusion, we believe with careful planning and some modifications, the restoration of Los Cerritos Wetlands would be of great benefit to the birds, wildlife and the public. “The source of limitless creative inspiration, birds connect us to the rhythms of life. Their migrations mark the shifting seasons, their music heralds each dawn, and their shoreline searches highlight the ebb and flow of the tide. Avian art resonates and inspires in endlessly novel ways, too. Talented artists from throughout the world push standards ever higher, continually striving to be among those selected for the internationally renowned Birds in Art exhibition.” – Leigh Yawkey Woodson Art Museum. Following the close of the annual Birds in Art exhibition at the Leigh Yawkey Woodson Art Museum each fall, 60 of the 100 plus artworks embark on a national tour. I am excited to tell you that, for the third year in a row, the Fullerton Arboretum Nikkei Heritage Museum will host the Birds in Art exhibit from the Woodson. Dates are Dec. 8th, to Jan. 25th. Open: Wednesdays, Saturdays, and Sundays 12pm to 4pm. Having been to the Woodson twice and having seen three of the traveling art exhibits in California, I can say if you love birds, you will love Birds in Art. Fullerton Arboretum: fullertonarboretum.org, (657) 278-3407. For more info also see venues list and touring exhibitions. Walk Recap–Los Cerritos Wetlands Oct. & Nov.